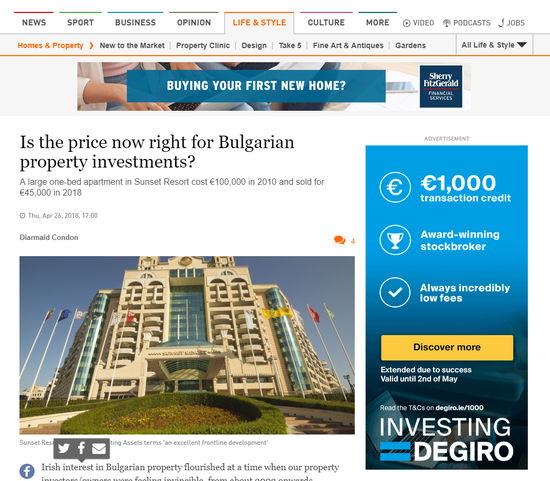 Irish interest in Bulgarian property flourished at a time when our property investors/owners were feeling invincible, from about 2003 onwards. Explosive capital appreciation in Ireland and overseas, in Spain for example, was viewed as bankable profit and borrowing against boom time valuations was widespread. Where does the market stand now? The Bulgarian market has long needed a strong Russian rouble for robust good health. Unfortunately for Irish and UK owners wishing to divest themselves of their Bulgarian investments, it has not had this foundation for a number of years now. A devaluing rouble means many Russians can essentially sell at a 30 per cent loss and recoup the same as their initial investment. This has not helped a market that is already oversupplied. British buyers, who at one point were quite plentiful, have dwindled due to currency and Brexit fears. Nowadays the main buyers in Bulgaria don’t have the purchasing power of yore. And there is a lot of product for sale, so prices have retreated significantly. Properties can still be sold but only if vendors are realistic, allowing for a strong buyers’ market. Dylan Cullen runs Appreciating Assets, a Dublin-based company marketing properties for Irish and UK owners, predominantly to Russian buyers. Cullen says it is important that clients be realistic about what they can achieve for their properties. “Although it doesn’t sound like much, a €3,000 price reduction on a property is a lot if the property is valued at €30,000. That discount has a huge impact, it could be the difference between selling a property or having it on the market for years. Buying power is relative, a coffee in Bulgaria costs 30 cent, it would be €3 here,” says Cullen. 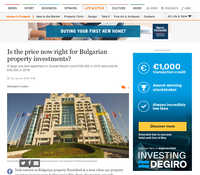 The flipside is that Bulgarian property is now remarkably affordable and probably appropriately priced. Properties that sold for €80,000 10 years ago are widely available now for €25,000. With direct Dublin to Sofia flights operating with Ryanair, and Bulgaria still a reasonably priced country to visit and invest in property – some of it quite high quality – few Irish buyers seem interested.